Donald Trump's AG nominee, William Barr, made his first appearance before the Senate on Tuesday. The Democrats on the Judiciary Committee, particularly Cory Booker (NJ), grilled him rather mercilessly. He's danced this dance before, having served as AG from 1991 to 1993 under George H. W. Bush, and having been confirmed three different times by the Senate overall, and so he bobbed and weaved pretty skillfully. That, in view of the above, it may be necessary to keep some elements of Mueller's report a secret. "If you're not going to indict someone, then you don't stand up there and unload negative information about the person. That's not the way the Department of Justice does business," he explained. Neither side in the shutdown drama has any interest in backing off their positions right now, and so we have entered the kabuki phase, in which the primary order of business is posturing in an effort to win the PR battle. Donald Trump, of course, knows a bit about staging a reality TV show, and so stunts from him and (maybe) his staff dominated the day's headlines. Trump's purpose was twofold: To reaffirm his image as a man of the people, and to illustrate the impact of the shutdown. The latter part is highly questionable, since even if the catering staff is furloughed, the White House mess is still open and could certainly have provided the food. Further, is there anyone in the country who was unmoved by all the folks who aren't getting paid, and all the trash at parks, and the airport delays, but was deeply moved by the fact that a group of football players were reduced to eating Big Macs? In any event, the maneuver has been poorly received, on the whole. Some critics have pointed out that items from the dollar menu are hardly apropos for recognizing a lifetime of hard work, others have focused on how it was just generally tacky, and still others wondered why—if the White House is currently not up to the task—Trump didn't just have his hotel handle the catering? Given how many things are currently broken due to the shutdown—TSA, SNAP, IRS, national parks, SBA, etc.—the argument that this shutdown will shine a light on how unnecessary most federal employees are is more than a little tenuous, and is rather insulting to those folks at the same time. Naturally, Trump retweeted the piece shortly after it went live. Why did it need to be anonymous? If the President liked the op-ed enough to retweet it, why would the author's job be in danger? Why isn't Trump angry? A leaker is a leaker, and if someone on Team Trump has gone rogue, and taken matters into their own hands, he should be irked. After all, this op-ed is pretty provocative, and runs the risk of inflaming public sentiment as opposed to guiding it. Why was it published by a fairly minor website? If the op-ed is what it claims to be, it's fairly major news. Surely, the New York Times would have published it, if it was legitimate. Or, if they are "fake news," then the Wall Street Journal. One is forced to wonder if The Daily Caller was the highest-profile outlet that was willing to publish it without asking too many probing questions. Inasmuch as Donald Trump has a long history of adopting an alternate identity when it suits his needs, this bears all the hallmarks of having been written on his orders. Or, at very least, written with his knowledge. Those were Acts I and II of Tuesday's performance, now on to Act III. Using Twitter, Trump ripped into Speaker Nancy Pelosi (D-CA) and Senate Minority Leader Chuck Schumer (D-NY), blaming them for the shutdown, and repeating his usual talking points about immigrants and crime and security and drugs. Then, he attempted to do a ham-fisted end run around them, and invited members of the House Democratic caucus to come and have lunch with him, sans Pelosi. Those folks are not fools, and know if they accepted his invitation, that; (1) Their base would kill them; (2) Pelosi would kill them; and (3) Trump doesn't stand by his deals, and so anyone who talks to him risks suffering all kinds of blowback, and then being left holding the bag. 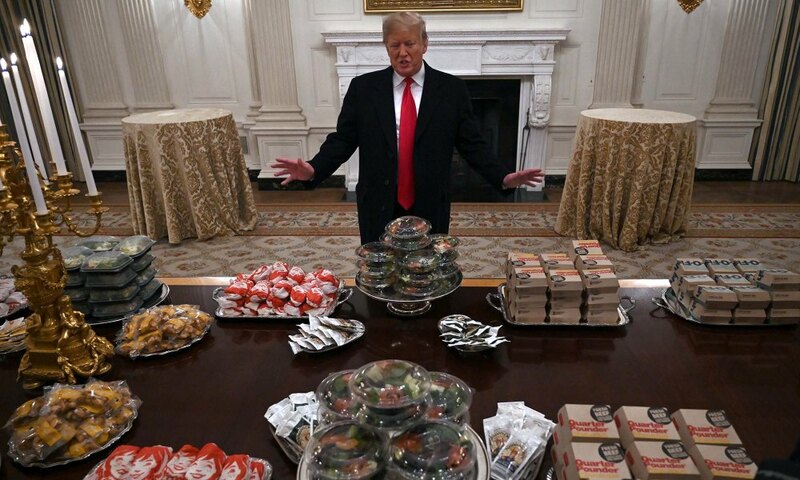 To nobody's surprise, no Democrat showed up for the lunch meeting (which probably means they were spared having to eat reheated Quarter Pounders). Because Paul Manafort's attorneys don't understand how to use their redaction software properly, the cat was already out of the bag: Special counsel Robert Mueller believes that Manafort was feeding information to Russian agent Konstantin Kilimnik while managing Donald Trump's presidential campaign. On Tuesday, Mueller filed a 31-page memo confirming that is exactly what he thinks. It's been evident for more than a year that Sen. Kirsten Gillibrand (D-NY) was planning a presidential run. It's been evident for several weeks that she was surprised by the timing of Sen. Elizabeth Warren's (D-MA) jumping into the race, and that she was hustling to make up for lost time, so as to get her hat into the ring as soon as possible. On Tuesday, Gillibrand made it official during an appearance on "The Late Show With Stephen Colbert": She's forming an exploratory committee to assess a potential presidential bid. This is the first step that most of the serious candidates take, so that they can get to work without triggering the full set of FEC campaign finance rules (although Rep. Tulsi Gabbard, D-HI, and Julián Castro both skipped right to a formal announcement of their candidacies). We've noted, many times, that one of the downsides to formally announcing one's candidacy for president is that the target on one's back grows geometrically in size. Tulsi Gabbard, who just declared over the weekend, is serving as a useful illustration of that point. She garnered some of the wrong kind of headlines on Tuesday, as reporters reminded the world of her work for an anti-LGBTQ organization run by her father (a prominent member of the Hawaii legislature), as well as her staunch opposition to gay marriage/civil unions, at the start of her political career (early 2000s). It is true that quite a few Democrats back then held views on LGBTQ rights that are way out of step with the modern Party. That includes Barack Obama, who was officially opposed to gay marriage until 2012. However, Gabbard comes from a very blue, and very progressive, state. She almost certainly did not need to be anti-gay marriage in order to get elected, and she certainly didn't need to be as outspoken on the issue as she was. On top of that, she's taken other positions—many of them quite recent—that are going to get scrutiny and are going to give Democratic voters, particularly progressives, pause. In particular, she's pretty hawkish on Middle Eastern matters. She opposed intervention in Syria, lambasted the Iran nuclear deal, and she visited Fox News several times to share her view that politicians should not shy away from using phrases like "radical Islam" and "Islamic extremism." On Monday, the House Republican Steering Committee stripped Rep. Steve King (R-IA) of his committee assignments in response to remarks he made in the New York Times expressing support for white supremacy and white nationalism. On Tuesday, the House voted 424-1 in support of a resolution that was ostensibly meant as a rebuke to the Congressman, but didn't actually mention him by name. Instead, it broadly declared that the House, "[R]ejects White nationalism and White supremacy as hateful expressions of intolerance that are contradictory to the values that define the people of the United States." Way to go out on a limb, there. That one "nay" vote was from Rep. Bobby Rush (D-IL), a member of the Congressional Black Caucus, who felt that Tuesday's resolution did not go far enough. He's got a resolution that could come up for a vote as soon as today, and that would censure King by name. Rep. Tim Ryan (D-OH) has one, too. On one hand, formal censure is only symbolic, and so isn't that much of a sanction. On the other hand, that's all the punishment that Sen. Joe McCarthy (R-WI) got, which would mean that King is in danger of being lumped in with the most notorious non-criminal member of Congress of the last century. It's just over two months before the UK is supposed to leave the EU (March 29). And so, Prime Minister Theresa May was compelled to bring her Brexit plan up for a vote in parliament, despite surely knowing that it would fail. It did, in historic fashion, by a vote of 432-202. Because of the way that the British parliament works (with lots of party loyalty, and bills not being brought up unless they are likely to win), that is the most lopsided defeat of a bill in modern British history. A vote of no confidence in May is expected today. She will probably survive, but beyond that, nobody quite knows what happens next. Given that many of the "nay" votes were from MPs who felt May's deal was too weak, many others were from MPs who felt it was too aggressive, and still others were from MPs who don't want to leave the EU at all, there's not exactly a middle ground upon which a new deal can be put together. Further, there's no indication that the EU would be willing to reopen negotiations, even if May tried. So, the UK could leave the EU with no plan in place at all, which would be pretty bad for the Brits. Or, there could be a delay, or a new referendum, or possibly even a cancellation of the Brexit. It's a brave new world across the pond.